Tradeshows are a great opportunity to interact and connect with customers, partners and prospects within similar business avenues. Planning for your next tradeshow and don’t know where to begin? We’ve come up with a seven-step checklist to help make it easier than ever to prepare for your next big networking event. Doing your research ahead of time ensures you’re hitting the right tradeshows for your brand. This could be online or in-person: talking to other businesspeople who have attended the shows you’re considering and getting their feedback can be even more useful than Google sometimes (shocker, we know). Make sure you’re getting a good ROI on your tradeshow by setting measurable goals. Some examples include costs, lead generation, scheduled follow-ups, closed deals and social media engagement. You can use this information to help set the guidelines for your next tradeshow. Booth design is key when it comes to making your brand stand out at a tradeshow. Booth location and layout can play a big factor, as well as what kinds of technology you use to convey your information. Giveaways are guaranteed to draw people in and make sure you’re remembered post-show, just make sure they’re practical and provide value and information about your brand to attendees. From tech items like PopSockets, USB drives to tried-and-true classics like sunglasses, having good promotional products at your booth is a must at any tradeshow. One size does not fit all when it comes to interactions with attendees. 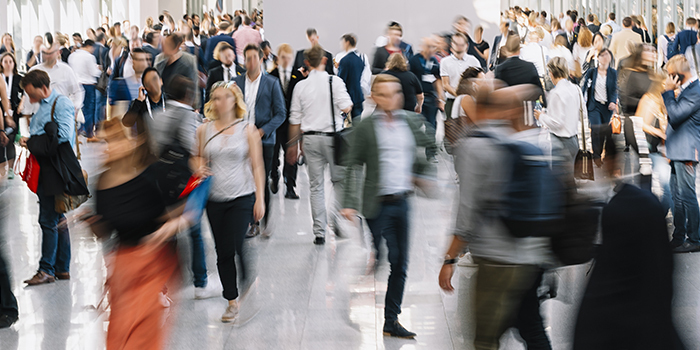 Ensure a successful trade show experience by creating personalized interactions, which are essential to building valuable relationships with prospects that stop by your booth. Most tradeshow attendees enter already knowing which booths they’d like to see. Start early and utilize social media, curated content and advertising to start catch prospect’s eyes prior to the event. You could even add intrigue and provide a teaser of what’s to come. Then use the event app if applicable to start scheduling appointments. We can’t stress this enough: book your flights and hotels as early as possible! Having plans set in advance will minimize stress in the weeks before the event and hopefully allow a smooth arrival and setup before the show. Live events almost never go exactly as planned. Make sure you are prepared for any hiccups that might come your way! There’s a lot of work that goes into attending a tradeshow, but with the right plan of action, the ROI can be quite lucrative. If you follow these simple steps and see your hard work pay off with the kind of amazing results only a tradeshow can produce!